In order to address the problem, the Saudi Kingdom’s Ministry of Municipalities and Rural Affairs appointed the consultant Dar Al Handasah to propose a solution. The objective was to allow the large number of pilgrims, which increases each year, to exercise the ritual at the specific time in the safest way possible. 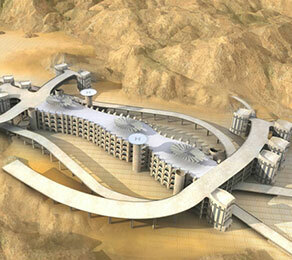 The proposed concept consisted of three sets of platforms, elliptical in shape, over several levels. Each ellipse had to be centred on one ‘Jamarah’, as the stoning point is called. It was essential that pilgrims should be able to see all three Jamarahs from any location, walk past each one and throw their stones safely. The solution was the creation of column–free spaces, with spans of 60 m to 100 m.
An additional constraint was the time allowed for construction. The site had to be available for the Hajj pilgrimage, which takes place at 11-month intervals. Because of the time required for clearing and preparing the site to receive the pilgrims, construction had to be condensed into a 10-month period each year. The structure was designed as multiple adjacent box girder bridges, spanning between columns at 18 m intervals. Bridges were built using the precast segmental post-tensioned construction method. Transverse post-tensioning was also necessary in order to achieve a two-way slab action of each 60 m x 100 m platform.